A desi twist to Death by Chocolate? We think so! This thali from Desi Klub is complete with eight different dishes made completely of chocolate, so get ready to go into a choco-coma. 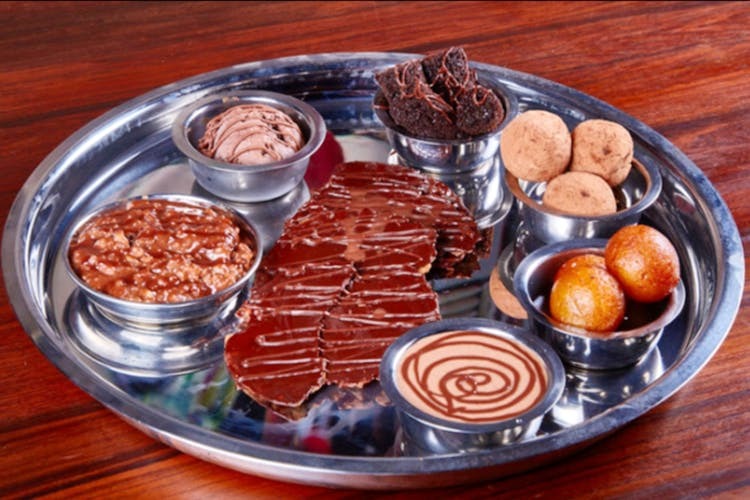 The Chocolate Thali available at Desi Klub in Chetpet is one of their many out-of-the-box dishes from their unique Mumbai-style menu and we’re sure it’ll take you all the way to chocolate heaven! It comes with eight completely chocolate-based dishes – a milk chocolate khakhra, a choco shrikhand, a white chocolate lollipop, chocolate gulab jamun, a chocolate soup, a choco swissroll, chocolate truffle and a scoop of classic chocolate ice cream. And it costs INR 415. It is obviously and undoubtedly a bestseller at Desi Klub but they also have other crazy combinations! Have you tried their Bubblegum Milkshake, Utterly Butterly Bakes Vadapav, Tacos Indiana, Maggi Satakli, Paan Cheesecake? We can’t wait to!